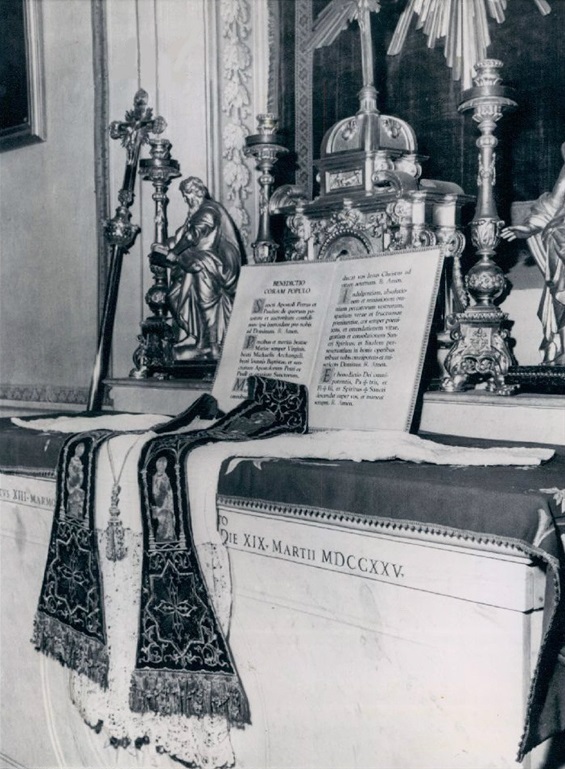 (AP Wire photo, Oct. 23, 1958) Caption: "IN READINESS FOR A NEW POPE -- The book recording the ritual of papal blessings and the formal vestments for the ceremonies are placed in readiness on a Vatican altar for one of the first official acts of the new pope when he is chosen by the forthcoming conclave. The new pontiff traditionally starts his reign by extending his blessing "Urbi Et Orbi" (To the city and to the world) from the balcony of St. Peter's Basilica to the throngs massed in St. Peter's Square." ------------------------------------------------------------------------------------------------------------------------------------------ (Papal Prophecy of Venerable Bernard de Bustis, 15th c. "...near the time of the Antichrist, will come... a most violent conflict with the Roman Church such that there will be great tribulations. At this time, A SCHISM WILL BE PRODUCED IN THE BOSOM OF THE CHURCH ON THE OCCASION OF THE ELECTION OF THE POPE... there is one who will be CALLED the true pope, but he will NOT BE truly so. HE WILL PERSECUTE THE TRUE POPE and all those who obey him, so that the majority will declare themselves for the antipope rather than for the true pope. But this antipope will have a sad end, and the TRUE one will REMAIN the unique and uncontested pontiff." ------------------------------------------------------------------------------------------------------------------------------------------ At the 1958 Conclave on October 26th: "Siri, [according to FBI sources], obtained the necessary votes and was elected Pope Gregory XVII". (*Declassified U.S. Department of State secret dispatch, "John XXIII", issue date: November 20, 1958, declassified: November 11, 1974 [Also see] U.S. Department of State secret file "Cardinal Siri", issue date: April 10, 1961, declassified: February 28, 1994.) *Note: The 1917 Code (Canon 1814) states that civil documents are to be presumed genuine unless the contrary is proven by evident arguments. that, an interregnum (he MERELY HYPOTHESIZES SPECULATIVELY) could last 40, 100, 1000+ years, & it would not contradict the teaching on the Church's Indefectibility. I have heard people speculate if there is life on other planets. God could do this. It is not my concern. My time is spent on getting Peter back His Throne now! Sede-V's ONLY see a continuous FALSE pope since 1958--why do they remain blinded to believing that Peter HAS perpetual (TRUE) successors? Affected Ignorance? Monstrous Pride & $elf-Interest: warped/corrupted by these Fatal Sins the devil need extend but little effort in Entirely blackening their minds & consciences.